Public servants should provide the same protection to school children and staff as firefighters have sought for themselves, Mass. lawmakers were told Sept. 5. Parents, teachers and elected officials told the Mass. Joint Committee on Education that the Int’l Assn. of Fire Fighters has removed cell towers on firehouses because they were causing “cognitive impairment, insomnia, and other health issues to their members.” IAFF has issued a position paper opposing cell towers on firehouses. 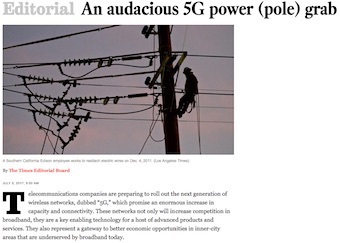 Los Angeles Times on July 5th ran an editorial denouncing the "Audacious Power Grab" of the telecoms in rolling out "5G." They presented information on the lack of safety testing before wireless products were rolled out, the vulnerability of children and fetuses who absorb more radiation than adults, and the fertility studies that show male human sperm exposed to a laptop caused DNA damage, slower motility and fewer viable sperm in just four hours of exposure. They asked for the application of biologically based non-thermal public exposure limits instead of the FCC's 30-year old outdated thermal exposure limits. They called upon the state to request the FCC to complete the review initiated by the U.S. Government Accountability Office in 2012 to assess FCC limits and bring them in line with current science. They indicated 900+ comments have been formally filed by doctors, scientists, the American Academy of Pediatrics, the American Academy of Environmental Medicine and others calling for biologically safe limits to which the FCC has not responded. They also spoke of the formal position of the IAFF and asked that local schools similarly protect children from wireless radiation exposure. They want plans this year to transition to hard-wired technology with the wireless systems turned off except in emergencies. They thanked the districts of Ashland, Worcester, Southborough, Medway, North Middlesex Regional and others for examining this issue and asked the Dept. of Elementary and Secondary Education to investigate non-industry funded scientific findings and protect students and staff accordingly. They emphasized that hard-wiring iPads, Chromebooks, smartboards and other wireless technology is not only possible and safer, but also brings faster speeds, better data security, and more reliable connections. Others were encouraged to send in written testimony to help educate the legislators on the need to provide safe technology access in schools. The mainstream media is almost silent on this topic because of the advertising power of AT&T, Comcast, Time-Warner, Spectrum, CenturyLink and other large telecoms. Health advocates note the Los Angeles Times on July 5 ran an editorial denouncing the “Audacious Power Grab” of the telecoms in pushing “5G” (Fifth Generation) Wi-Fi transmission equipment but only mentioned the large size of the devices and not their effect on health from microwave radiation. This was proof, if any were needed, that major media are unduly influenced by the telecoms, say health advocates. “Telecommunications companies are preparing to roll out the next generation of wireless networks, dubbed ‘5G,’ which promise an enormous increase in capacity and connectivity. These networks not only will increase competition in broadband, they are a key enabling technology for a host of advanced products and services. They also represent a gateway to better economic opportunities in inner-city areas that are underserved by broadband today. LAT is owned by Tronc which is buying The New York News.